A little-known ship that sailed after the turn of the century, the RMS Titanic had only one small mishap during its entire seagoing time. All right, perhaps that's a bit wrong. Easily the most famous ship of all time, the story of the Titanic has been told repeatedly in print and in film since its fateful encounter with an iceberg in April 1912. 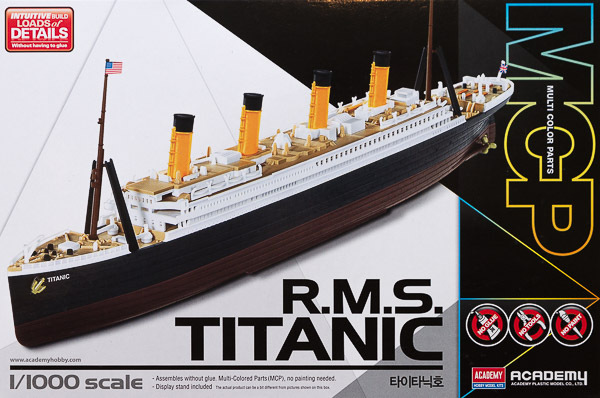 As such a famous vessel, numerous kits have been produced, and Academy has added no less than four Titanic models in three scales to their catalog. This kit is the smallest of the Academy Titanic kits, at 1/1000 scale. It comes molded in several colors, facilitating building the model without paint. Colors include hull red, black, brown, tan, orange, white, and gold plated. 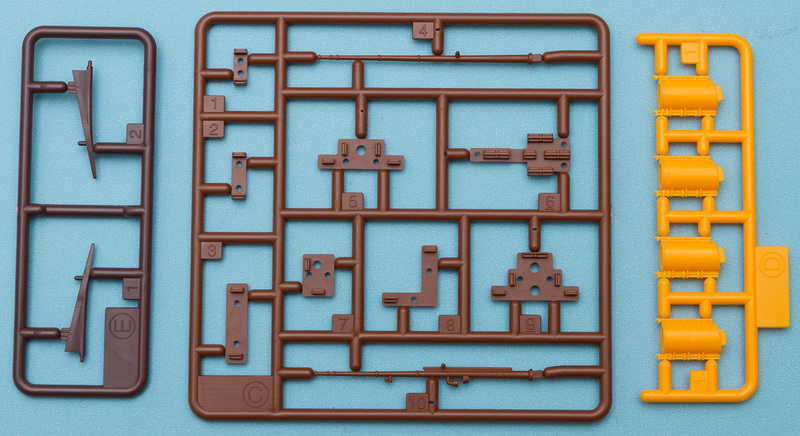 Overall the parts are well detailed, with raised and recessed detailing to highlight the base component structures. Granted, in 1/1000 scale everything should be perfectly smooth, with not even a rivet seen, but these representations do a great deal in suggesting at the texture of the actual vessel. Construction begins with the main hull. This is made up of a one-piece lower section in hull red, a center section in black, and an upper center section in white. The hull red portion also has two separate strakes for the outer propellers, and all three screws are provided in plated gold plastic. Also in gold are the anchors for the bow. Moving on to the upper deck, the fore deck is built up from several pieces, including a white base and a tan deck area. 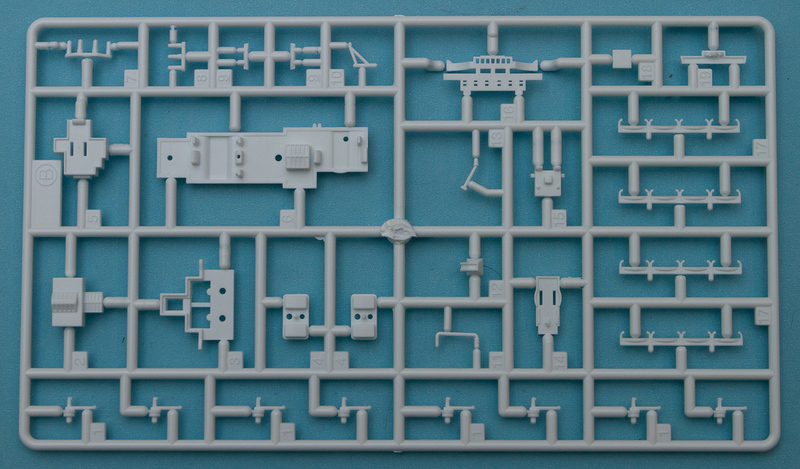 Cranes and other bits are provided in white plastic, and the completed assembly fits onto the main hull. A similar treatment is given to the aft deck, although that is a bit more complex with more parts. Once both of those are in place, though, the center white section can get its detailing. The center deck gets quite a bit of work, and indeed most of the rest of the parts will find their way onto this section. There is a tan main deck piece, that has three separate white superstructure pieces, one of which gets an additional roof of decking. All the life boats get fitted onto this piece, as well as the four funnels. 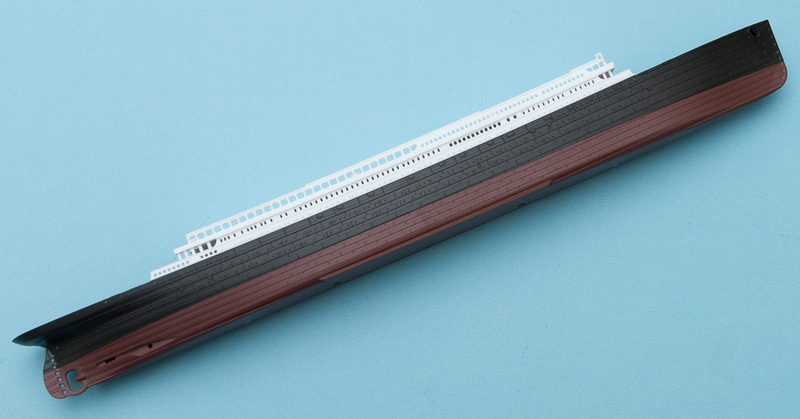 This completed deck piece fits onto the top of the white center section, and with the addition of the two masts, one fore and one aft, this kit is basically finished. There are a few stickers to add to the boat, and a stand to finish things off, and there you have it, a nice foot-long Titanic model. 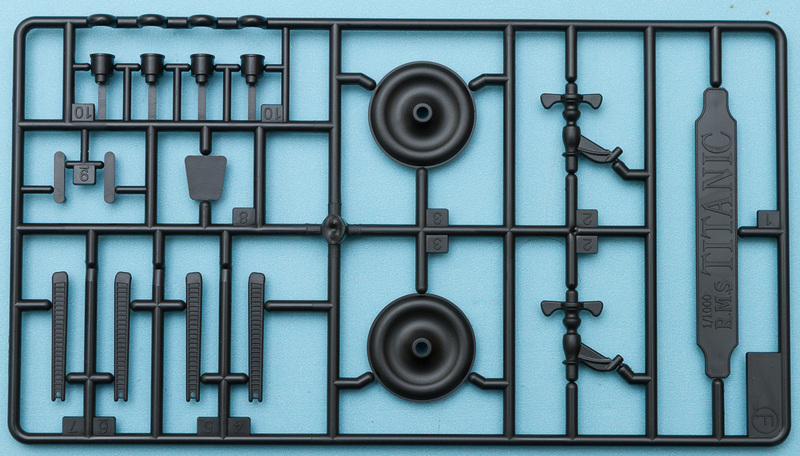 This is a nice little kit that is designed for the younger crowd, and its combination of good detailing with simple assembly should appeal to a broad audience. If you're looking for a solid model to get someone started in the hobby, this could be an excellent choice. My thanks to MRC for the review sample.